The Rajapaksa-verdict has arrived. No one assaulted Chris Nonis. He drank too much and fell off a stool. Twenty eight fellow-guests have given written evidence to that effect[i]. Perhaps Chris Nonis, physician, diplomat, businessman, now has an inkling of what it feels like to be Mohammad Irshad. Mohammad Irshad was the Samurdhi official who was tied to a tree by Mervyn Silva. That outrage was committed in public, in the presence of many witnesses including uniformed police officers. The video of the minister’s criminal conduct is still available on You Tube[ii]. 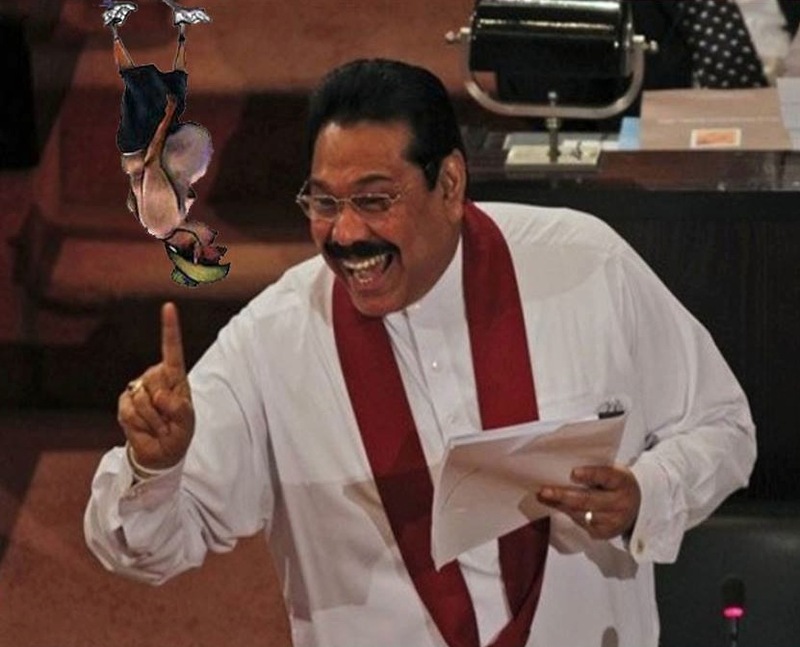 But a Rajapaksa committee found Mr. Silva not guilty and concluded that Mr. Irshad tied himself to the tree. Now, according to another Rajapaksa committee, Chris Nonis, like Humpty Dumpty, ‘had a great fall’; the King’s Man was blameless; all the King’s Horses have sworn it was so. Earlier Minister Rambukwella claimed that Dr. Nonis was a gate-crasher at the party. Now an official government report accuses him of being uncontrollably inebriated. The implication is that Dr. Nonis, incapable of handling the copious quantities of liquor he guzzled, fabricated a story about being assaulted. Ergo, Dr. Nonis is either a liar/slanderer or he is severely delusional. Based on the report, Sajin Vass Gunawardena can file action against Dr. Nonis for loss of reputation and mental trauma. Who can doubt that Lankan courts will find Dr. Nonis guilty? According to the report in Ceylon Today, a letter signed by several staffers at the Lankan High Commission in London accompanied the report. One cannot but wonder what further crimes the letter accuses Dr. Nonis of! From Mohammad Irshad to Chris Nonis, via J Tissanayagam and Sarath Fonseka, the path of Rajapaksa justice is clear. The guilty will go free and the innocent will be punished. There will not be a lack of witnesses or judges to enable this perversion. Jeyakumari Balendran is still languishing in jail, accused (though not charged) of terrorism. The same authorities claimed that they cannot find any evidence against Kumaran Pathmanathan. Mr. Pathmanathan is wanted by India and the Interpol; he was the LTTE’s chief money-manager and weapons-procurer – and Vellupillai Pirapaharan’s chosen successor. But Rajapaksa investigators cannot find any evidence linking him with the LTTE. He is innocent and free, unlike the elderly Ms. Jeyakumari, whose only ‘crime’ was her insistence on discovering the fate of her son. Imagine the shape and the course of Rajapaksa justice during a Third Term. Dr. Nonis spent the last several years vigorously defending the Rajapaksas against charges of abuse and impunity. Now the same march of abuse and impunity has claimed him. He is reportedly too scared to return to Sri Lanka. That fate of self-exile will befall many more Lankans during a third Rajapaksa term. Gotabaya Rajapaksa is on record stating that traitors should be given capital punishment. In Rajapaksa Sri Lanka, a traitor will be decided not on the basis of facts and laws but on the basis of the needs, interests and whims of the rulers. During a third Rajapaksa term, condemning Rajapaksa opponents as traitors, via a Chris Nonis type investigation, might become the norm – and be accepted as such by a majority of the populace. After all we have forgotten that there was a time when the total removal of presidential term-limits was unthinkable and a political solution meant more and not less devolution. Fritz Stern argued that “civic passivity and willed blindness were the preconditions for the triumph of National Socialism….”[iii] That verdict is apt for Sri Lanka as well. A majority of Sinhalese may believe themselves to be unaffected by such Rajapaksa phenomena as the militarization of civil society and the steady occupation of the private sector economy by Rajapaksa kith and kin. But the monumental fall of Chris Nonis demonstrates that a third Rajapaksa term presents a clear danger to all Lankans, including Rajapaksa acolytes. A land in which the guilt or the innocence of a citizen is decided by rulers according to their needs/desires is nothing but the jungle. 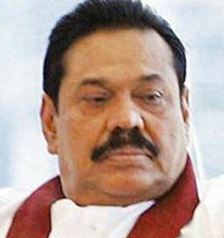 A salary increase was among the many boons President Rajapaksa included in his election-oriented Budget. The pay-hike was to come via an increase in the COL allowance and the inclusion of all allowances in the basic salary. Just two days later, the Ministry of Plan Implementation announced that the pay-hike will happen only in July 2015, as the preparation of the new salary structure will take time. In the interim, an allowance of Rs.3,000/- will be given. Are we to believe that neither the President nor the officials realised that the new salary structure cannot be implemented immediately? The truth is that the much vaunted salary hike is nothing but a classic Rajapaksa-eyewash. By July 2015, national elections are likely to be over. Then the regime will find some reason to abandon the promised pay-hike, while slashing the Rs. 3,000/- allowance based on dubious COL figures. A new threat to national security from terrorists/fundamentalists/separatists will provide an ideal excuse. The second Rajapaksa term saw the mushrooming of BBS type extremist organisations. This phenomenon will intensify during a third Rajapaksa term. As economic difficulties mount and hopes plummet, the need for diversions and scapegoats will increase. Religion, as a narcotic, has a dual function; it can induce slumber or unleash frenzy. The first was the traditional role of traditional religion. The overtly/explicitly politicised religious manifestations, from BBS to ISIS, aim at turning the ‘faithful’ into raving hate-machines willing to embrace barbarism in the name of fundaments/purity. The implication is obvious; those (Christian/Muslim) religious institutions considered by the BBS to be ‘illegal’ will be attacked. And the BBS will do so in the name of Buddhism and Catholicism. The fact that the participants in this protest included a Western Province provincial councillor, the deputy chairman of the Mahara Pradesheeya Sabha and a representative of the Catholic Church[v] is indicative of the way Lankans will be pitted against each other during a third Rajapaksa term. As expected, several Sinhala Buddhist organisations including Bodu Bala Sena and Sinhala Ravaya have decided to back Mahinda Rajapaksa at the upcoming elections[vi]. They and/or others of their ilk will have an even more critical role to play in a third Rajapaksa term – widen/deepen the existing ethno-religious faultlines and create new ones, so that Lankans become viscerally incapable of making common cause against Rajapaksa rule. 2.Also add following crimes to the credit of MARA..
b)Allowing fraudulent practices of Namal including the exam fraude at Law College following the foot steps of father but he was not involved in I impersonification……. 3.It will be a meritorious act if Tisarani and patriotic journalists write a book on “THE CURSE OF MARA AND HIS FAMILY. 4.MARA should read these comments to understand what others think of his achievements and realise what is in store for him in 2015!!!!!!!! Listen to venerable Athureliya Rathana thera’s speech at Nugegoda. We need more of Ven.Athureliya Rathana theras and Ven. Sobitha Theros like to awaken the people. We also need many more of Tisaranees to contribute and to wake up the sleeping Opposition UNP MPs. They should start writing to CT like Tisaranee and Prof.Rajiva. We miss Lasantha, Prageeth, Kugan, Fredrica etc.